Last Friday our last caterpillar made its way to the top. We are now patiently impatiently waiting for the butterflies to emerge. We hope it won't happen during the weekend. 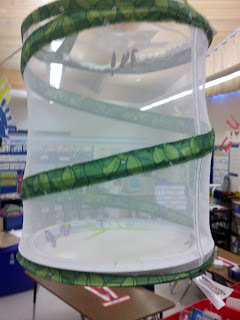 I was able to hang the netted enclosure that came with the caterpillars on a clothesline in my classroom. They are up high and out of the way. Everyone can still observe them with their eyes and not their hands. I placed a paper plate in the bottom to keep the enclosure clean. You are welcome Annie- thanks for stopping by.